A kit is now available from It’s A Stitch Up containing both skeins of yarn used in sample, plus a copy of the eBook that contains patterns for both hats. Each kit sold includes a £5 donation to the charity Refuge, helping women and children in need of shelter from domestic abuse. 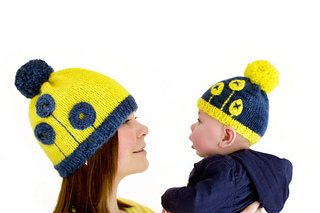 Blooming Marvellous is part of a duo of hats that have been designed to celebrate and support women in children in need. The proceeds of this eBook, which compromises two hats (Bloomin’ Marvellous and Little Bud) will be donated to the women’s shelter charity Refuge. The price for an eBook containing both patterns is set at a modest £3.50, however, if you would like to pay what you can, please visit This Page to make a donation (anything from £1, $1, €1, etc, up to whatever you can afford, more or less than the pattern (added to which benefit, no Paypal or Ravelry fees will be deducted, and no VAT if you are a UK taxpayer… Just pop your Ravelry name, email address or some other way to contact you in the comments section there and I will send your pattern (there may be a slight delay as I will not be at my computer all the time). 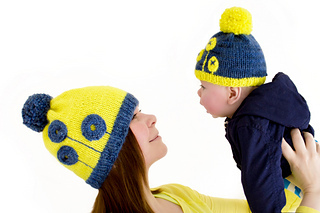 Both hats are designed to have a gathered crown which provides soft yarns with a lesser amount of structure the support to make a pompom look it’s best. 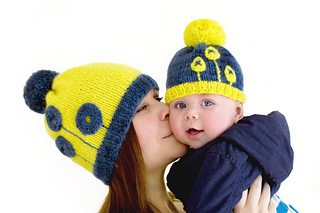 Instructions for making a pompom and templates to do so are included in both patterns. The embellishments on each hat are what set each apart, symbolising the growth and new beginning of those in need who receive help and support, whether it be from loved ones and friends, or organisations and charities such as Refuge that go towards helping women and children grow and bloom, and one day hopefully to help people become Bloomin Marvellous. Little Bud is also a poignant name, as the photos are of me and my own little one, who though still just a bud, will bloom himself. He is also my little buddy, and another form of support alongside my husband, my friends, and in the past Refuge, the charity for which any proceeds are directed. Anyway, stop reading this: please just chuck a small donation this way, or via The Charity Donation Page and feel good to have made a difference today!